The smoldering remains of the Outpost Tavern, a former astronaut hangout near NASA's Johnson Space Center, burned down in a fire on Oct. 15, 2010, months after closing in January. 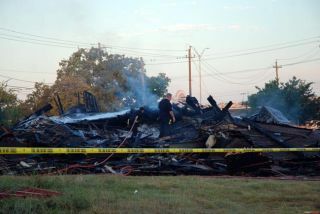 "There was no electricity running to the building," assistant firechiefRick Vargas told collectSPACE.com. "It is certainly suspicious." Vargasand his fellow firefighters were onsite on Saturday morning dousing the still smolderingpile of debris with water and foam. Vargassaid that none of the tavern's trademark astronaut and spacememorabilia thatonce lined its walls had been found among the burnt remains. "Justkegs and other bar-relatedstuff," said Vargas. The Outpostclosed inJanuaryafter its property owner sold the land on which the bar and grill satsince1965. Prior to that, the building was located at nearby EllingtonField, whereit served as barracks for airmen. Soonafter it was closed, landlord WalterWright had the building movedthe shortdistanceto a neighboring lot, with reported stated plans to convert it to afamilyrestaurant. Wrightclaimed that Outpost proprietorStephanie Foster had removed "thousands of dollars" of spacememorabilia prior to the building being shuttered, according to mediareportsfrom January. Fridaynight's fire caused enough structuraldamage to the building that firefighters had to call in a backhoe toknock downits walls. Seemore photosof the OutpostTavern fire from collectSPACE.com.